I am in awe of the boundless variety of color and form that exist in nature and in the human face and by the way light, time and states of mind fluctuate and change what we see and how we appear.My on-going work, Lamentation/Jubilation, consists of two installations of many individual portraits whose placement shifts as I continue to add new images to the series.Initially, I painted Lamentation to express my reaction to the tragedy of September 11. As I worked on the images, the world situation worsened. I realized my subject was not restricted to the one horrific event, but was universal and historical. 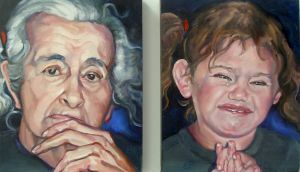 Deciding to make a more global statement against war, hatred and intolerance, I juxtaposed portraits in a symbolic way. For example, next to a grief-stricken Palestinian woman is an Israeli man in a state of shock; next to a black woman is a white woman whose gestures of grief are identical; next to a stoic elderly woman is a crying young child.Jubilation is the antidote to the sadness and grief in Lamentation. It depicts the faces of family members, friends and others expressing happiness and amusement in all their varied manifestations. Lamentation/Jubilation exemplifies the opposite extremes of human emotion. In painting these two bodies of work, I have portrayed aspects of the human condition that we all experience and that remind us that—despite our differences—we are essentially the same. Elizabeth Bloom is a visual artist, teacher and curator. She began her art studies by attending the famed Barnes Foundation in Merion, PA where she studied art history and aesthetics. She also studied painting and drawing at Fleisher Art Memorial in Philadelphia, where she won the Gimbel Excellence Award for Painting.While living on the east coast, Bloom won numerous portrait commissions and exhibited her work at art institutions and galleries including The Philadelphia Art Alliance, The Hahn Gallery, Museum of the Philadelphia Civic Center and a traveling Smithsonian exhibition, American Drawings ’76. She also received the Founder’s Award at the Woodmere Art Museum.Bloom moved to Los Angeles in 1980. 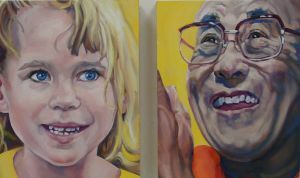 She has exhibited paintings at many venues, including Loyola University Law School Galleries, Grossmount College, Brand Library, In Collaboration Gallery and the University of Judaism. Her work is included in the collections of UCLA Medical Center, CBS Studios, American Jewish University, Midway Hospital, Bryan Cave McPeeters & McRoberts, Brodey and Price and is in many private collections.From 1991-94, Bloom was a Visiting Artist for the Getty-sponsored Institutes for Educators on the Visual Arts. She gave hands-on workshops and lectures on the experience of being an artist to teachers and administrators from across the nation.Bloom was a judge for the BRAVO Award for Achievement in the Arts from 1994-2000. This award, given annually by the Music Center of Los Angeles Education Division, acknowledges teacher and school excellence in the arts. During those same years, she taught painting at the University of Judaism. Currently, Bloom is Curator of the Platt/Borstein Galleries at American Jewish University.